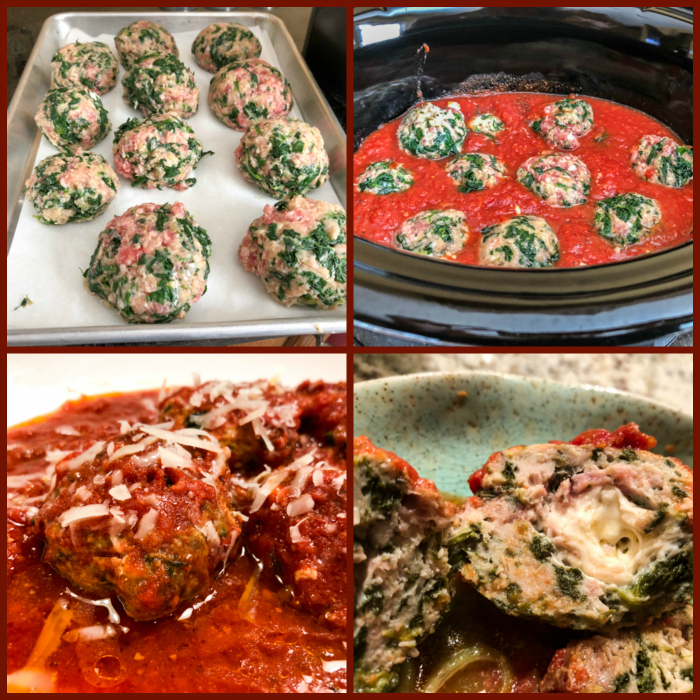 A little note added after publication: today is the first Monday of the month, so let me tell you which was my favorite post of January: Happy New Year in My Kitchen! If you’ve missed it, here is the link. But come right back, ok? To see what many of my virtual friends pick as their best post, visit Sid’s blog. Start by sauteing shallots in coconut oil in a large skillet until translucent and fragrant. Season lightly with salt and pepper, then add the kale. Cook until wilted, transfer to a bowl and allow it to completely cool. If you like to cool it faster, add it to a baking sheet on a single layer. In a large bowl, add the two types of meat, the sautéed kale, egg and egg yolk. Season with a little salt (the sausage is already seasoned), then add the almond flour. 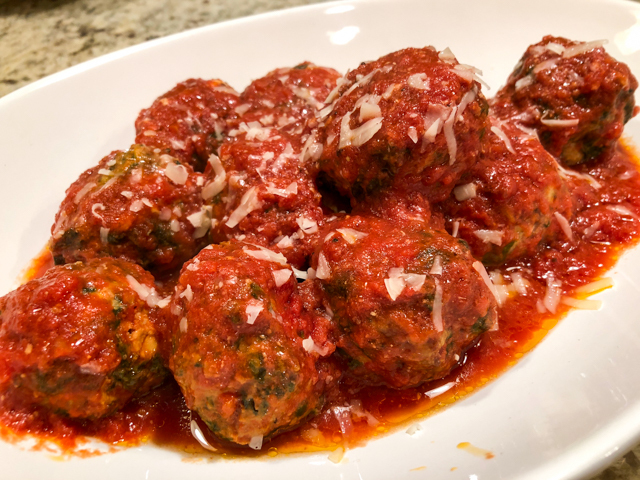 Mix gently and form into large balls, incorporating a small mozzarella ball in the center. 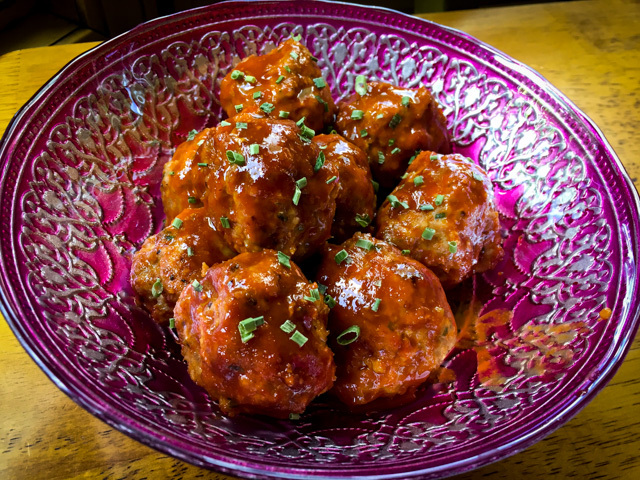 You should have enough for 8 to 9 chicken meatballs. Refrigerate them for one hour or more to firm them up. You can make this the day before. Pour the crushed tomatoes in the bowl of a crock pot, add the water (or stock) and the butter cut into large pieces. Season with some salt and pepper, add the Herbes the Provence. Place the meatballs gently inside. Cook on low for 5 hours. 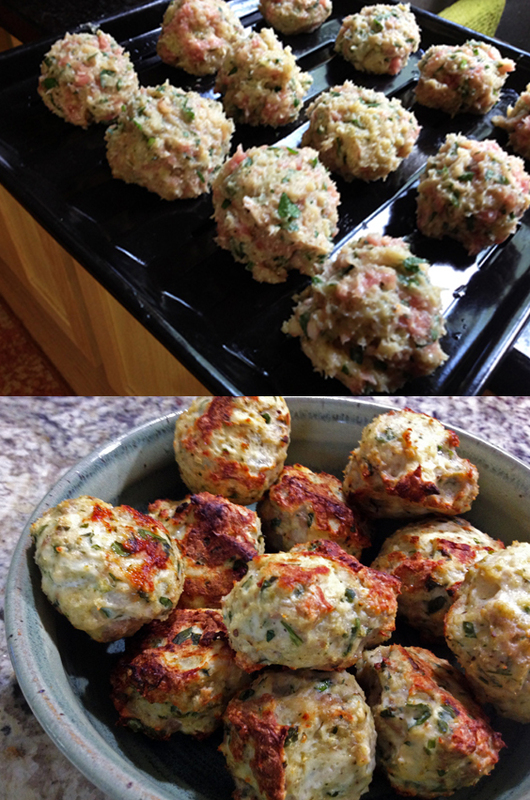 If you have a chance, flip the meatballs after a couple of hours. Serve right away or save in the fridge for next day, when flavors will be even better. Comments: I prepared the chicken meatballs on Sunday, stored them in the fridge, started them cooking next day during our lunch break. My slow-cooker keeps the food warm for a couple of hours, so we don’t have to worry about rushing home in that type of situation. Mondays are usually tough. You’d think that we would be all relaxed after the weekend, but truth is there is so much to do around the house that by the time Monday comes we are seriously hoping it would be Friday instead… For that reason I try to plan a very easy dinner for the first evening of a working week. Now, of course, not everyone is as spoiled as we are, having the chance to go home for lunch. Keep in mind you can always do the slow-cooking part in the evening, then enjoy them for dinner the day after, they only get tastier. I was thrilled that Phil decided to stick with his smoothie and cereal bar for lunch later that week. I did not have to share the leftovers… Yes, he is a keeper. But I suppose I’ve mentioned that a few times. FOUR YEARS AGO: Sweet Fifteen! In a large bowl, mix together the breadcrumbs, almond milk and 1 tablespoon Marsala. Leave it soaking for 5 minutes. Add the chicken, pecorino, egg, parsley, 1/2 teaspoon of the salt and the pepper. Gently mix together the ingredients until just combined. 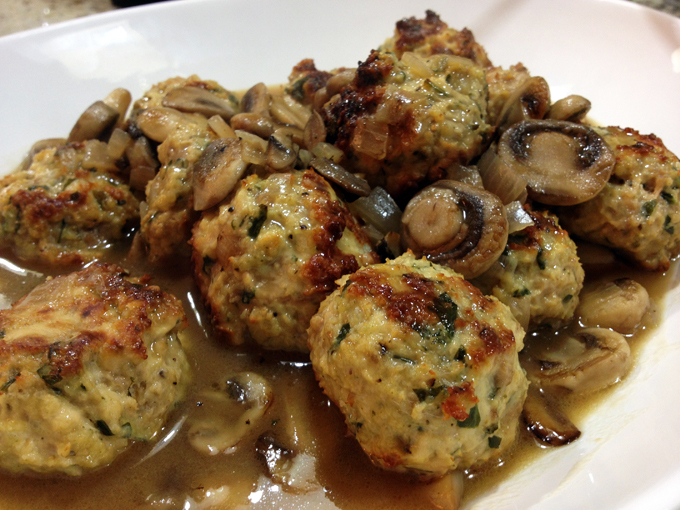 Form the mixture into tablespoon-size balls and place on an oiled baking sheet. Broil for 5 minutes, or until the meatballs are beginning to brown and are just barely cooked through. Flip them around and broil the other side for a few more minutes. Remove from the oven and set aside. In a straight-sided skillet, heat 1 tablespoon of the olive oil over medium-high heat. Add the mushrooms and cook, stirring with a wooden spoon, until the mushrooms are brown on all sides, about 5 minutes. Add the shallots, the cepes powder, and the remaining 1/2 teaspoon salt and cook for another 2 minutes. Lower the heat to medium and stir in the flour and the remaining 1 tablespoon olive oil. Add the 1/3 cup Marsala and stir until the mixture is smooth. Whisk in the chicken broth and simmer for a few minutes. 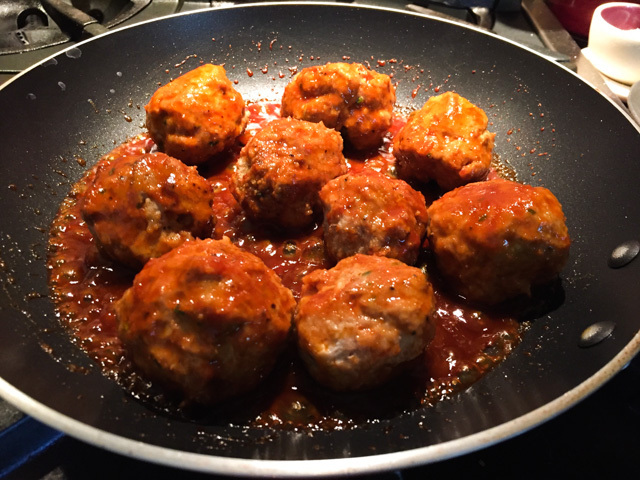 Add the meatballs to the sauce and simmer for an additional 5 minutes to let the flavors blend, under very low heat. Comments: We both loved this meal! One of the important tips for success is handling the meatballs as softly as possible. Wet your hands if you prefer, form the balls and do not pack them tightly, or you might compromise the texture. 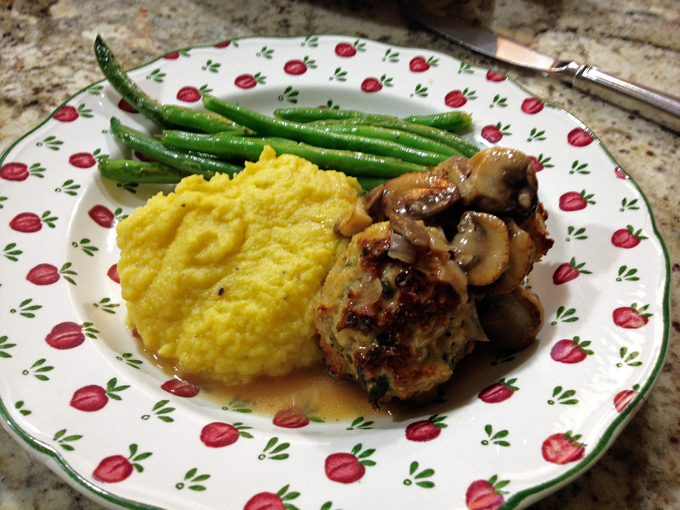 I used regular mushrooms, but cremini or a mixture or wild mushrooms could be great. Of course, having that special cepes powder to splurge only added a touch of sophistication to the meal. A little bit goes a long way, the smell is terrific! I know that it is a very unique ingredient I was lucky to receive as a gift, but even without it this will be a delicious meal. TWO YEARS AGO: October 16th: World Bread Day!